According to Molly Dannenmaier's A Child's Garden , "to thrive, children need complex environments." Our bare strip of back yard lacks any place to hide, splash, dig or explore. But what if I already used up my budget with the vegetable beds? This week we're working on a simple fort structure--not much more than a platform raised a few feet off the ground. 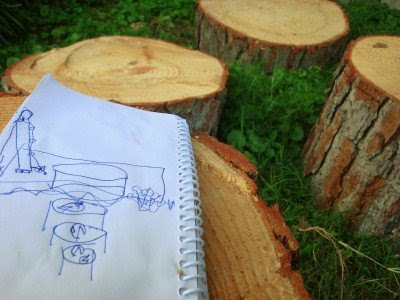 Andrew spotted these logs in someone's yard, asked permission to take a few, and quickly sketched a plan. Excellent idea. I'm sure it will provide hours of fun and adventure! This is a fascinating post! A few years ago our Pastor talked about some research he had read one time that said that the majority of missionaries and Christian workers came from rural settings. The researchers thought that it was because kids who grow up in the country generally have environments that foster quiet, outdoor reflection and creativity! Living out in the country does give you many opportunities for exploration and creativity as a kid. My husband grew up on a farm and I can vouch for the fact the he and his brothers are very much creative problem solvers because they had to learn to fix things and work in all types of outdoor environments growing up. They also STILL talk about the forts they made and the creeks they used to explore, etc., even though they're now all 50-ish year old men! And most of the people that we go to church with also grew up on farms, and I see this same characteristic in many of them. So I think that the author you quoted is exactly right and spot-on with her observations. You are such a good mom, Meredith, for always seeking out the best things for your kids in ways that are within your means and ability! Please post more photos of the finished product! It looks like a neat project! Looks like both the building and playing will be wonderful for Andrew, and his siblings too! Love it! My dad is a builder, so my sisters and I grew up drawing house plans. You just have to sketch it out first! what a cool fort, Andrew. We cut down an old apple tree into play stumps when the kids were little, but they never turned into a fort! What a great plan! You might also want to try making a play house out of large cardboard boxes. My daddy did this with several times, and it was so much fun. Please share pictures of your completed project. I'm sure it will be great! It's even better when they build their own forts! How about a sunflower house if you have some bare ground? Sunflowers will grow in almost any soil and improve it for the next planting. Can't wait to see how everything turns out. For those not blessed with wood rounds and stumps in their back yard (grin) if you see the city taking down a tree, often they'll be happy to part with some of the rounds for your kids. Also, planks are wonderful- an 8 foot 2x6 that's leftover from a construction project is a wonderful toy. Sometimes you can get them at a discount from a lumbar yard, if they're horribly 'crowned' then contractors don't want them to build with. Awesome!! We made a fort for our kids out of 5 pallets we scrounged from a farm implement dealer. Five pallets, nuts and bolts, a little sanding, and some yard sale paint and our kids had an awesome fort complete with floor and ceiling! It's amazing what a person can do with some scrounged items and a little imagination!! Have fun, Andrew! I think encouraging creative living is a great way to overcome the " I'm bored " syndrome . In that spirit, I would like to recommend the book Westlandia by Paul Fleischman . It is a very inspiring story of a boy who creates his own world . I look forward to seeing what your creative children build. When I was a child I used to wait for the fairies to visit the dead circle of grass by our front door . The books about " fairy gardens" are also inspiring ! We've made "tents" and "forts" with sheets and clothes pins for years. You can use clothes lines, tree limbs, or just run temporary ropes between anything you can tie them to. My kids loved this, and when finished, we just threw the sheets in the wash.
Love it! We built a fort when we were little out of pallets leaned up against a fence. We even tucked in a carpet remnant for wall to wall carpeting! Thinking back, it was probably pretty ugly...Oh well, it was fun! Just wonderful creative problem solving--an excellent skill to develop for adult living! Just wanted to mention that the drawing is excellent. He got the perspective and elipses. Good work, Andrew. Yes, yes, children need hideouts! You are clever! This is the first time I've visited your blog! You have artistic flair! I love it. You guys are so creative. I can't wait to see the finished product. Meredith, this post proves your lovely optimism. I read that same book and only looked at the photos lamenting my lack of funds and ability. Thanks for the inspiration to create a more complex environment. I know my children create despite our boring backyard but it should be easy to add a little something.